NEW G.I. Style 1qt. 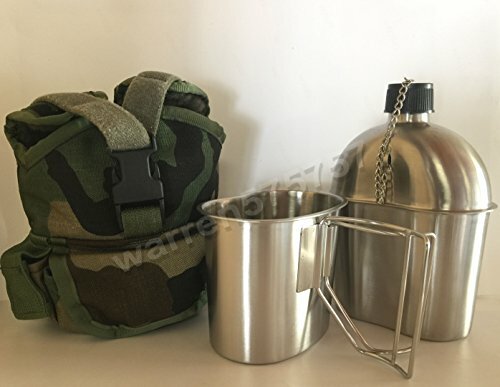 stainless steel canteen with Cup (BRUSHED MATTE FINISH). Made of food grade steel. Imported. (WITH US MADE VERY GOOD CONDITION LIKE NEW)Woodland Safariland Pouch can be used for multiple purposes. They are lined to keep drinks cold or hot. They also have two drain holes in case the pouches gets rain in them. There are 2 pockets on the front with button snap closures. One is about 1.75 inches height and about 1.25 inches wide and .5 inches deep. The other is about 2 inches height and about 4 inches wide and 2 inches deep, this one also has 2 drain holes.